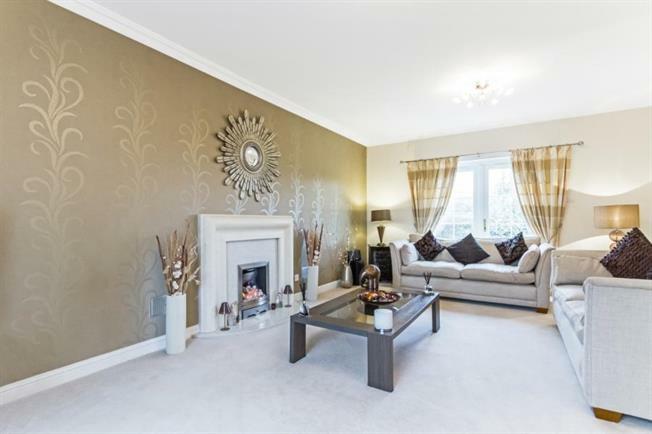 5 Bedroom Detached House For Sale in Helensburgh for Offers Over £365,000. Accommodation comprises: Impressive reception hall with open tread staircase leading to a galleried upper landing; WC/cloaks room; Large lounge with viewing aspects to both front and rear, feature fireplace with living flame effect fire, French doors lead to the rear garden; Formal Dining/Family room; Dining room which is partially open plan to the kitchen, has patio doors giving access to the rear garden; Good sized kitchen with range cooker, integrated dishwasher, American style fridge/freezer; Utility room with space and plumbing for washing machine and tumble dryer, door to side garden; Study room which could be utilised as a 6th bedroom; Large master bedroom with dressing room; 4 piece en-suite shower room; Bedroom 2 is another large double bedroom with dressing room and a 3 piece en-suite shower room; The remaining 3 bedrooms are all double sized and have in-built wardrobes; Three piece family bathroom. The subjects are enhanced by double glazing, a gas fired central heating system with 'combi' boiler and recently installed BT Superfast Broadband which runs at speeds of up to 50 MB. The front garden is made mainly up of monoblock driveway, affording off-street parking and access to the garage. The rear garden, which enjoys views over fields and towards Ben Bowie is split into two defined areas all encompassed by screen fencing. There is an area of lawn with peripheral shrub beds. A large area of decking makes an ideal seating and socialising area which is accessed from the dining area.